Who's the Average Indian Home Buyer? Recently, I wrote a piece for the Mint newspaper, where I tried to explain the dichotomy of why housing sales as reported by real estate consultants are going nowhere, whereas home loans are going from strength to strength. In this piece, I dwell on the same issue, though in a lot more detail. In a recent research report, the Mumbai based real estate consultancy Liases Foras pointed out that the total number of unsold residential units across eight big cities (Mumbai, Pune, Ahmedabad, Kolkata, Chennai, Bengaluru, Hyderabad and Delhi NCR) for July to September 2018, stood at 949,175 units. This was around 1.05% higher than the same period last year. The point being that on the whole, homes aren't really selling. If homes are not selling, then home loans given by banks and housing finance companies should not be growing as well. But that is clearly not the case. Home loans have been growing at a pretty good rate. Take a look at Figure 1. Figure 1 basically plots the growth in home loans as well as overall growth in non-food credit. Banks given loans to Food Corporation of India (FCI) and other state procurement agencies to buy rice and wheat directly from the farmers. Once these loans are subtracted from the overall loans given by banks, what remains is non-food credit. What does Figure 1 tell us? It tells us that home loans have been growing at a faster pace than the non-food credit growth. In fact, in October 2018, total home loans disbursed by banks grew by 17.6%, which is the highest in two years. This obviously leads to the question, if there is so much demand for home loans and banks are disbursing them, why isn't this being reflected in real estate sales. For what other purpose do home loans serve than to buy homes? Home loans are basically of two types-priority and non-priority. A priority sector home loan is a home loan of up to Rs 35 lakh in a metropolitan centre with a population of ten lakh or more, used to buy a home worth up to Rs 45 lakh. Any home-loan in a metropolitan centre, which does not fulfill this definition gets categorised as a non-priority home loan. In non-metropolitan centres, a priority home loan is a home loan of up to Rs 25 lakh, used to finance a home worth up to Rs 30 lakh. Let's take a look at Figure 2, which basically plots growth in priority and non-priority loans over the last one year. What does this tell us? It tells us that non-priority home loans are growing at a much faster pace, though the pace of priority sector home loans has picked up in the recent months. Prima facie, this shouldn't sound surprising given that most homes in cities cost more than Rs 45 lakh, the cut off for priority sector loans. But things are not as straightforward as this. There is another point that needs to be made here. The average home loan given by the State Bank of India is around Rs 23-24 lakh. The State Bank of India is the largest lender of home loans in the country. Given this, the value of the average home loan comes well under the limit set for a priority home loan. Also, the definition of priority sector loans was changed in June 2018, earlier this year. Up until then, home loans of up to Rs 28 lakh in a metropolitan centre used to buy a home worth up to Rs 35 lakh, was categorised as a priority home loan. In a non-metropolitan centre, a home loan of up to Rs 20 lakh, used to buy a home worth up to Rs 25 lakh, was categorised as a priority home loan. Hence, at least for a metropolitan centre, the average home loan size comes under the earlier limit for priority home loans, as well. So, the average home loan size is lower than the new and the earlier limit for a priority sector home loan. But the non-priority home loans are growing at a much faster pace on a much higher base. In November 2016, non-priority home loans formed around 56% of total home loans. This jumped to 62% by October 2018. How do we explain this dichotomy? If the average home loan is well within the limit of a priority sector home loan, why are non-priority sector loans growing at a faster clip? Let's assume the average home loan given by the State Bank of India is Rs 23.5 lakh. As mentioned earlier, this comes well within the limit of a priority sector home loan. The average loan to value ratio of a SBI home loan is 53.62%. This basically means that the bank finances 53.62% of a price of a home on an average. Given this, the average price of a home being financed through a State Bank of India home loan works out to around Rs 44 lakh (Rs 23.5 lakh divided by 53.62%). Rs 44 lakh is under the new limit of Rs 45 lakh for the priority sector home loan. But the new definition came in only in June 2018. Also, in case of private banks, the average loan sizes are bigger than that of State Bank of India. The point being that while average home loans are well within the definition of the priority sector home loan definition, the prices of average Indian homes, are not. This explains why the non-priority sector home loans have been growing faster. Now to the final point of this piece. The price of an average home being financed by the State Bank of India is around Rs 44 lakh. Of course, this is the price registered in the books of the bank and does not include the black portion, which is paid in cash. If we assume a black portion of 20% (and I am being very realistic here, given the amount of black money that is being demanded these days in the real estate deals in the Delhi-NCR region, at least). At 20% black money, the real average price of a home being financed by State Bank of India comes to around Rs 55 lakh (Rs 44 lakh + 20% of Rs 44 lakh). State Bank of India gives out a third of the home loans being given out in the market. Hence, Rs 55 lakh is a good number to work with. The eight cities were close to a million units of residential units are lying unsold, barely have anything that costs lower than Rs 70 lakh. This explains why these homes are not moving. They were expensive and continue to be expensive. Sales, of course, are happening in places beyond these top eight cities, not covered by the real estate consultants. Also, people are buying investor owned properties, where they can negotiate a little more on the price. Over and above this, investor owned properties also tend to be in buildings and spaces, where people are already living. All this explains why home loans are growing but home sales at builder levels aren't. We request your view! 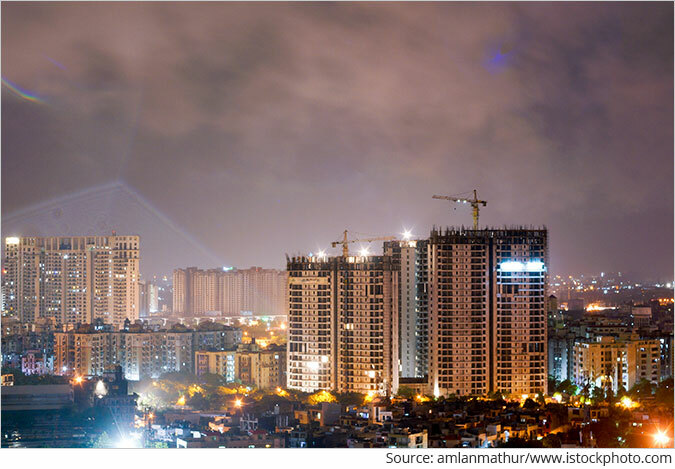 Post a comment on "Who's the Average Indian Home Buyer?". Thank you for posting your view! 2 Responses to "Who's the Average Indian Home Buyer?" Home Loan is well thought conspiracy to make common man financial slave for most of his life 15-25 years!! Home Loan is shame on human being as home is one of the basic requirement of human like food and water. Hope the time will not come when you write a piece of article on Food loan in near future!! Vivek - if what you are saying is true - i.e. "people are buying investor owned properties,", another big factor will be loans transferred. Will such transactions actually be not more on the investors' loans being closed and new loans given to buyer? If so should we not also look at loan closures - something like a net loan would be more appropriate to see 'real' credit growth -right?